Founder Gary Midbrod grew up on the north shore of Duluth working in the family fishing business at an early age where he learned the value of a strong work ethic helping after school and on week-ends when necessary. Taking pride in doing a good days work and the sense of accomplishment that goes along with it would serve him well when starting Midbrod Electric many years later. In 1984 the family moved to stillwater while he attended electrician’s school at night. 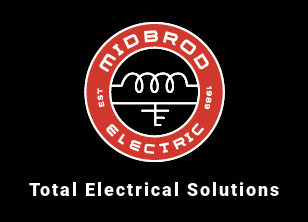 Passing the state’s Electrical Journeyman’s exam in 1987 and the Master Electrician’s exam in 1989, it seemed like the right time to take off on his own and Midbrod Electric was born. In 1998 son Krist came aboard to help with the growth and has been with the company ever since. Today, Midbrod Electric is a licensed, bonded and insured electrical contracting company uinquely qualified to provide personalized attention to large industrial and commercial projets as well as residential. With a highly trained staff and a fleet of trucks, Midbrod works hard for its customers and are proud to operate a thriving, locally owned business. The key to their success is maintaining a sense of urgency in completing projects on time and on budget with a focus on precision and care while providing a safe and clean work environment for customers and employees. Satisfied customers are the best advocates, generating repeat business and a healthy source of referrals. “We take great pride on every project regardless of size and scope and work hard to earn your trust each and every day. That is how we built and maintained a successful business serving the communities of Stillwater and the Twin Cities for almost 30 years. We truly appreciate your business and hope to be here generations to come.